Many people often think of fireplaces as fitting into traditional decorating schemes or only being appropriate in certain styles of homes. Fireplaces are cozy and quaint and stir thoughts of rustic mountain lodges or historic homes that originally required wood fires for heating, but one may seem out of place in your house. 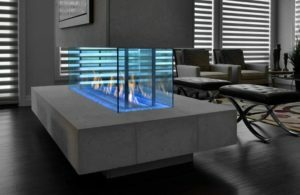 If you tend to like a more modern look, or your unique home just doesn’t have the customarily necessary features to easily accommodate a fireplace (like an existing chimney or an expanse of open wall in a living room or family room), you’ve probably just assumed that a fireplace wasn’t for you. Today we’re taking a look at why you will want to reconsider that assumption! DaVinci Custom Fireplaces present an award-winning gas fireplace option that’s more flexible and safer than most traditional models. DaVinci fireplaces fit in literally any type of room in your house and require no chimney – these high-tech, decorative fireplaces utilize a power venting system that’s innovative with regard to the exhaust. No matter where you decide your DaVinci fireplace will look best, whether in the middle of the room or installed in any wall, these statement pieces can make your fireplace visions a reality. And we’re proud to offer DaVinci Custom Fireplaces as a distinctive new choice here at LanChester Grill & Hearth. One of the most advanced features common to all DaVinci fireplace configurations is the flexibility in venting, which allows installation in virtually any room. 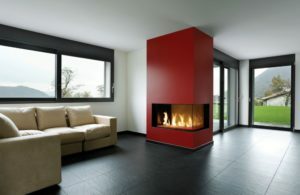 Not having to rely on a chimney for exhaust and utilizing a sophisticated powered venting system that pulls combustion air into and around the fireplace while simultaneously exhausting combustion gases through the exhaust vent and out of the building means these fireplaces can be freely placed in almost any part of a room, as well. In fact, DaVinci Custom Fireplaces are often installed in the center of an area or placed as a room divider in large spaces. Seven individual configurations including “pier” and “island” designs allow the fireplace to be the stunning centerpiece within an area, no wall required! Of course, if you have a smaller room or just like to keep floor space relatively open, DaVinci linear configuration or Maestro series square and rectangular designs can be a focal point in any wall. Choose to install in the center of an exterior-backed wall like a traditional fireplace, or create a conversation piece by placing at a corner. Linear configurations are available in lengths between 3 and 21 feet with a wide range of height and view style options, as well. And, one of DaVinci’s newest offerings is the “L,” a configuration that features a 90-degree angle in the flame presentation to create a truly striking visual. Did you notice that we mentioned DaVinci Custom Fireplaces’ ability to bring beauty to any space or room? We really do mean any room, whether it’s inside your home or outside! Some DaVinci fireplaces can even be built into non-covered exterior walls, which is an impressive feat for a fireplace. (All DaVinci fireplace configurations are approved for covered outdoor installation.) If you’ve always dreamed of creating a comfortable and beautiful outdoor room like an outdoor kitchen for entertaining, a DaVinci fireplace can make your perfect outdoor living space exceptionally inviting. Going hand-in-hand with the fact that DaVinci fireplaces can be installed virtually anywhere is their unparalleled safety. Safe Touch Glass™ comes standard in all DaVinci fireplaces and maintains a very low temperature that entirely eliminates the possibility of burn injuries, which can be a risk with traditional fireplaces. This double-paned glass offers a crystal clear view that’s suitable for homes with children, pets, and others who may feel compelled to get a little too close to the fire. 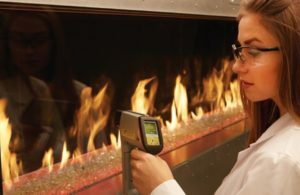 For this reason, DaVinci fireplaces are also an excellent option for commercial locations like office lobbies or hotels. Because DaVinci fireplaces are designed to be decorative, providing heat is not the primary goal, and these fireplaces actually remain cool to the touch across all of their exterior surfaces beyond the glass. This allows all models to be installed with zero clearance to combustible surfaces. You read that correctly – DaVinci Custom Fireplaces can be installed in sheetrock and even wood without any type of barrier between the fireplace and the material itself. Designers especially love this flexibility, but it also means installation is more straightforward, too. If you do need to add heat to your space with your fireplace, DaVinci offers a heat exchanger add-on option, as well, while retaining safety and flexibility in design. At this point, it’s probably obvious that DaVinci fireplaces are a premium option that offers almost endless possibilities for bringing the beauty of a fireplace into your life. As with most contemporary home upgrades, DaVinci fireplaces are also high-tech and provide fun, futuristic features that make living with your new fireplace effortless. With DaVinci’s standard Platinum Crushed Glass media back-lit by multi-colored LED lighting, you can achieve a color-changing light show among the flames or set the perfect mood in your room. The TouchSmart™ wall control panel gives you access to an array of settings that customize flame presentation. If you want your DaVinci fireplace to have a more organic look, there are a number of media and log set options (known as Fyre-Art™) available, too. Would you rather see flames dancing among driftwood or birch logs instead of brilliant sparkling glass? Your personal preferences and taste can be easily accommodated. Different colored liners and optional metal trims are available additions to your fireplace design, as well. Above all, DaVinci Custom Fireplaces offer nearly unlimited ways to make your fireplace your own and a perfect fit for your unique home. DaVinci Custom Fireplaces come standard with a strong legacy of fireplace building and design, too. Made right here in the USA by Travis Industries of Mukilteo, WA, DaVinci fireplaces may present a new concept in fireplace design, but that is informed by years of industry-leading fireplace manufacturing experience. In fact, you may already know another one of Travis Industries’ well-known hearth product lines – Lopi stoves and fireplace inserts, which have long been a favorite brand among our customers here at LanChester Grill & Hearth. Ready to customize your own DaVinci fireplace or talk about other fireplace options that will make your home more inviting? Now is the time to get your project on the calendar before fireplace weather returns this fall! Stop in at our showroom in Gap, PA to see the DaVinci fireplaces on display, or get in touch today to start the conversation about adding a new and unique fireplace to your home.